"The voice of the Bavarian tenor Karl Liebl was recognised while he was studying to become a school teacher. In 1945, after serving in World War II, he became a Jugendlicher Heldentenor at the Stadttheater of Regensburg. Here he sang, among others, Riccardo in BALLO, Radames and his first Wagner role: Siegmund. The first of his frequent appearances at the Staatstheater of Wiesbaden was in 1951, thereafter, he began to develop into a Heldentenor. From 1955 through 1959 he sang at the Cologne Opera including Huon in OBERON at the opening of the new house. From 1956-59 he was a member of the Staatsoper in Vienna, where he sang in premiere of MATHIS DER MALER by Hindemith. From 1959 to 1968 he performed at the Metropolitan Opera (debut role: Lohengrin) in such roles such as Tristan, Walther von Stolzing, Erik, Loge, Siegmund, Siegfried, Parsifal and Herod in SALOME - in all, eight major roles in 57 performances. He died in 2007." “The American bass Jerome Hines had a long and distinguished career at the Metropolitan Opera singing a wide variety of rôles with true consistency of voice and style. He appeared with the company for more than 40 years from 1946. An imposing figure - he was 6ft 6in tall - he had a voluminous bass to match his stature. His charismatic presence made him ideal for the many rôles demanding a big personality. It was thus hardly surprising that Sarastro in THE MAGIC FLUTE, Gounod's Mephistopheles, the high priest Ramfis in AÏDA, the Grand Inquisitor in DON CARLOS, Boris Godunov, and King Mark in TRISTAN UND ISOLDE were among his leading rôles. Although always faithful to the Met, Hines made many forays abroad. In 1953, he undertook Nick Shadow, with Glyndebourne, at the Edinburgh festival, in the first British performances of Stravinsky's THE RAKE'S PROGRESS. That led to engagements in leading houses in Europe and south America, and eventually to Bayreuth, where he sang Gurnemanz, King Mark and Wotan (1958-63). In 1958, he made his La Scala début in the title part of Handel's HERCULES, and, in 1961, he first appeared at the San Carlo in Naples, in the title rôle of Boito's MEFISTOFELE. His Boris Godunov, at the Bolshoi in Moscow in 1962, was, by all accounts, a deeply impressive portrayal. 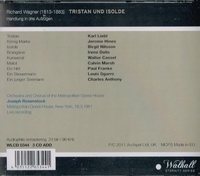 "[Rosenstock], like Bohm, could boast of a close relationship with Strauss. He had in fact earned the composer's imprimatur for his reading of ELEKTRA. In 1931, Strauss was reported to have whispered to Rosenstock after a Mannheim revival of the opera: 'Better conducted than composed'." "I personally prefer live recordings. What they lose in technical perfection they gain in vitality and spontaneity. A studio version cannot escape the danger of substituting a lovely collage for a true interpretation....I know for certain that there are many live recordings that are genuine as well as beautiful."